People love to feed birds. And squirrels, chipmunks, deer—even bears and sharks. We do it for our own pleasure and, sometimes, under the misguided impression we are helping hungry animals. But step away from the stale bread—here are four reasons why feeding wildlife is almost always a bad idea, both for the animals and for us. 1. FEEDING CAN LEAD TO INJURED ANIMALS AND PEOPLE. Researchers at Murdoch University in Western Australia and University of Aberdeen in Scotland analyzed nearly two decades worth of data from Chicago’s Brookfield Zoo Sarasota Dolphin Research Program and Mote Marine Laboratory’s Stranding Investigations Program and found an increase in the number of dolphins being fed by humans—along with an increase in dolphins injured or killed by boat strikes, entanglement in fishing gear, and ingestion of hooks and lines. At Stingray City, a shallow lagoon off Grand Cayman where large numbers of stingrays gather around boats of tourists that feed them, handling by those tourists had caused skin abrasions on the rays. Fed animals begin to equate humans with food, and can exhibit increased aggressiveness toward people, which has resulted in human injuries and even death. People have been bitten while feeding wild animals, some of which carry infectious diseases such as rabies, bubonic plague, or Hantavirus. 2. 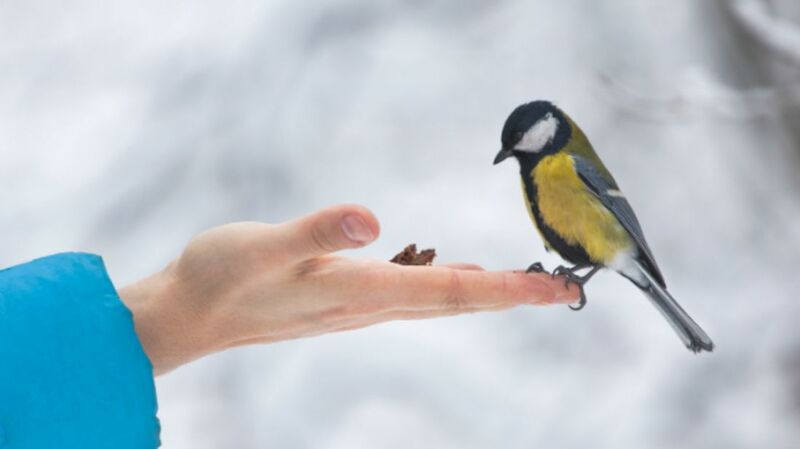 FEEDING ALTERS THE NATURAL BEHAVIOR OF ANIMALS. Feeding wildlife can change the animals’ activity levels and metabolic rates, reduce the size of their home range, and increase both intra- and inter-species aggression. Sharks, for example, don’t naturally share territory, and when they group around boats to feed, it can cause stress and shark-on-shark conflict. “Sharks are solitary predators not normally found in groups,” George Burgess, director of the Florida Program for Shark Research, told mental_floss. “With feeding, they associate humans in the water—and even the sound of a motor boat—with food, and come from long distances away. Most don’t go far away once the boat leaves, but hang out in the area knowing the boat comes every day, so the reality then is sharks in unusually high densities.” Unnaturally high numbers of predators in one place equals equally unnaturally high levels of predation, which affects the ecology of the entire area. Whitetip reef sharks that are fed in order to attract them for tourists showed elevated activity levels and increased metabolic rates during times they normally would rest. Metabolism influences most of an animal’s biological and ecological processes, so this represents clear evidence of feeding affecting the sharks’ critical biological functions. Researchers found that the rays at Stingray City have distinctly different patterns of activity than their wild counterparts. Wild stingrays forage at night across large distances and rarely encounter each other. The fed rays form schools, feed together, and mate year-round rather than during a specific season. They also show signs of unusual aggression, such as biting each other. Scientists don’t yet know whether these behavior changes could be harmful in the long run. In Slovenia, where bears are fed corn year-round, scientists found that the animals shortened the number of days of hibernation by as much as 56 percent. Bears regularly visited feeding sites throughout the winter, increasing their likelihood of interactions with other species as well as humans. 3. FEEDING CAN MAKE ANIMALS SICK. On some islands in the Bahamas and throughout the Caribbean, tourist operators take people to feed grapes, ground beef, and other foods to one of the world's most endangered lizards, northern Bahamian rock iguanas. Researchers reported different levels of calcium, cholesterol, and various minerals in fed versus unfed populations of the iguanas, as well as diarrhea, higher levels of glucose, and a staggering 100 percent endoparasitic infection rate in the tourist-fed animals. One of the study’s authors, Charles Knapp of the Chicago John G. Shedd Aquarium, recommends an education campaign to discourage iguana feeding and, at a minimum, using food specially formulated for the iguanas. In another devastating example, people frequently feed bread, popcorn, and fast food to white ibis in parks in Georgia. As a result, the birds are more sedentary than normal, and they come into contact with ducks, gulls, and city birds they normally wouldn’t encounter. Increased inter-species contact, combined with higher levels of stress hormones and weaker immune systems, could increase the spread of pathogens such as salmonella among them. A previous study found ibises infected with strains of salmonella that also make people sick—because of their range, the birds could move these pathogens over large distances. 4. FEEDING CAN EVEN LEAD TO ANIMALS BEING KILLED. All U.S. national parks prohibit the feeding of wildlife. But in some parks, bears have learned to forage for unattended human food. Rangers relocate these bears away from human food sources, but many eventually return and continue seeking human food—eventually, such problem bears must be euthanized. Being fed from cars can cause bears and other animals to congregate near roads where they may be killed by vehicles. Hanging around roads and parking lots can also make animals such as squirrels, birds, and deer easier for predators to catch. Tourists on Fraser Island, Australia have come to expect interaction with dingoes, including feeding the wild dogs. As numbers of tourists increased, so have reports of dingo attacks, and after a human fatality in April 2001, the government ordered a cull of the dingoes. Fed sharks lose their natural fear of humans and become bolder, coming closer than they normally would once they associate humans with food. When bites result, it contributes to the negative image sharks can have, Burgess says. “The sharks get the blame, not the humans in the water with bait and fish. We have a designation in the shark attack file, 'Provoked Attack,' meaning ones in which humans initiated the attack by doing something to provoke the animal. What is more provocative than dangling fish in front of a shark’s nose? Of course, the word provoked doesn’t appear in the headline. Whatever advantage is gained in conservation by letting people see what beautiful animals sharks are gets cancelled out by the headlines of someone getting bit.” In response to shark bites, officials sometimes kill sharks in the area where the encounter occurred even though, Burgess says, the chances of killing the specific shark involved are slim to none. He notes that feeding can result in shark deaths another way: “There have been examples where fishermen came to areas where sharks were attracted by a feeding operation and fished them out."